This is the first game in the Katakis series. For other games in the series see the Katakis category. 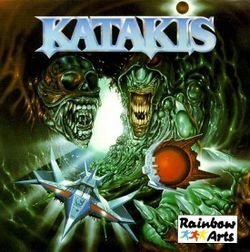 Katakis is a 2D horizontal shooter developed for the Commodore 64 by Rainbow Arts in 1987, and converted to the Commodore Amiga by Factor 5 in 1988. It was re-released as Denaris in 1989 due to legal pressure regarding a contract that Factor 5 had with Activision to port R-Type to the Amiga. The Commodore 64 version was programmed by Andreas Escher, who created the Commodore 64 version of R-Type, and Manfred Trenz, who worked on Crush (Katakis 2). This page was last edited on 28 July 2012, at 19:44.